Amanda Assad Mounser’s fierce jewelry line may be young at just three years old, but when it comes to designing statement-making baubles, the New York native is clearly a pro. Having worked previously for Moschino and Alejandro Ingelmo, Amanda used her experience to branch out and create her own 70s-inspired glam-rock jewelry that mixes both natural and man-made materials for a jewelry line that’s part boho-chic, part rocker-inspired. 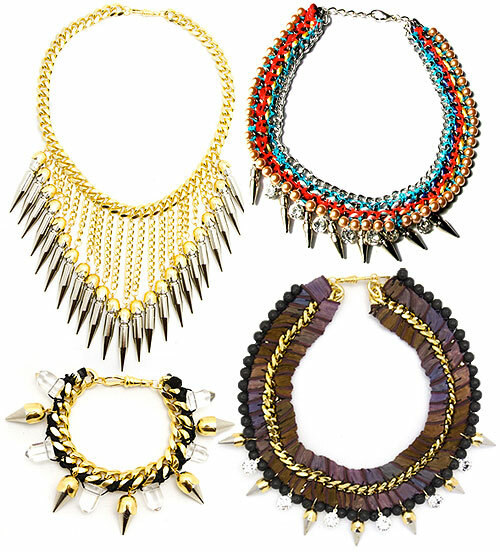 While her agate and quartz pieces have been earning her plenty of praise by the likes of In Style, Vogue, Marie Claire, Nylon, and more, it’s her spike-embellished jewelry that’s really got my attention! I love how she plays with contrasting textures – woven silk thread, chunky metal chains, and glimmering stones – for looks that manage to be elegant with just the right amount of edge. They’re perfect for the girl who likes to toe the line between gorgeous and dangerous, and they’re the perfect addition to a look that’s sophisticated but never boring or safe. Pictured above: Shine a Light Collar, Lady Jane Bracelet, Nomad Collar, and Paint it Black Collared Necklace.